This table lighter in a form of a jumping or rearing horse was probably manufactured after 1952 by M.T.C. in Japan. M.T.C. was a Japanese company active in the 50's and 60's. There are a lot of interesting examples of the craftsmanship of M.T.C. Looking around the lighter market M.T.C. 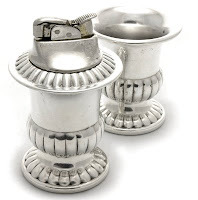 produced mainly chrome plate cigarette lighters. If anyone knows something more about M.T.C. please post a comment. The Jumping Horse is made of heavy chrome plate but was also available bronze plated. The lighter insert is not removable. This tall and very decorative Evans table lighter was manufactured in ca. 1950 in the United States. The nonferrous metal base is in a form of a sculpture depicting a little boy (angel, cherub?) that is holding a basket. It has a nice antique gold finish. The lighter unit is removable and gold-plated. The rounded base is padded with green felt and it has no visible markings on the base. 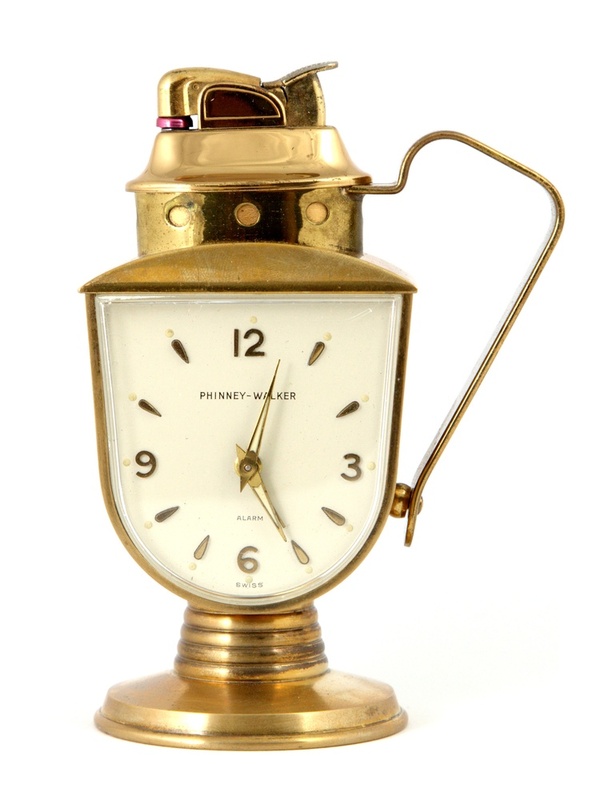 The combination and design of Phinney-Walker alarm clock and Evans cigarette lighter is a very fine example of the Art Deco style. This Alarm Clock Lighter was marketed in the United States in 1956–1960. Very collectible – many cigarette lighters collectors' guides have it on its pages. Its actual catalog name is Smoke-Time and 30-Hour Desk Lighter Alarm (model no. PW44E1400). The catalog retail price from 1959 was $ 22.50. The Phinney-Walker Co. was founded in New York in ca. 1903. In the 1910s and 1920s they designed and manufactured automobile clocks. The most popular Rim-Wind Car Clock called "Embassy" was manufactured in 1925 and was an eight day clock that was wound and set by rotating the outer rim (source). It was mounted among others in the 1930 Rolls-Royce Phantom II. The earlier version of the Phinney-Walker, also an eight day clock, was mounted in Ford Model-T. Starting from the 1930s the company became less a producer and more a marketing company. It was active till 1970s. The production was outsourced to many different companies placed in Germany (Semca), United States (mainly in Connecticut), Japan and Switzerland. Phinney Walker Co. was also very popular for marketing travel alarm clocks in the 1950s. The alarm clock is Swiss made and has a 30-hour mechanical movement. The clock's face has gilt figures, hours indicators with cream and gold/luminous hands, and a gold alarm hand. 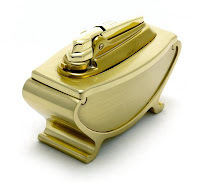 The case of the clock is made of brass, partly brushed and partly gold color plated. The lighter unit was provided by Evans (USA). It is made of metal and gold color plated. The rounded base is padded with blue felt. The Alarm Clock Lighter was advertised as: "Sure-Fire" appeal... that'll "light-up" the charm of the genial host or hostess. It's priceless for office or home. 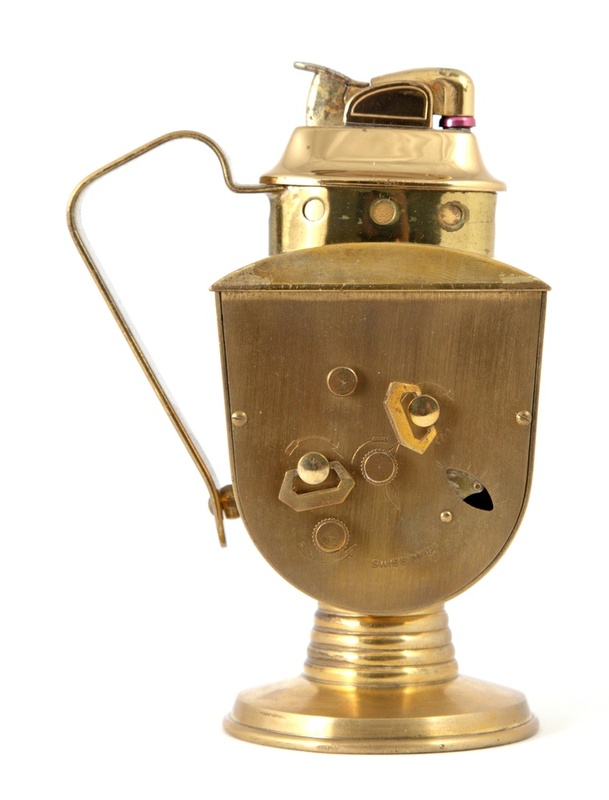 The same clock and lighter base was used by SWIZA (founded in 1904) an 8 Jewel Alarm Clock Lighter. The lighter insert however was not made by Evans but by one of the English suppliers. See here. The Ronson Tempo was manufactured since 1954 both in Toronto (Canada) and Newark (N.J., USA). It was marketed till 1956. This futuristic table lighter is oval shaped and it uses the face-lifted Ronson Standard fitment. It was manufactured in three different finishes. The most common is the chrome-plated version, the two others are rare: cooper plate and partly chrome plate and partly covered with a thin layer of black paint. The bottom of the table lighter is padded with green felt. The lighter name is unknown though it was manufactured in relatively small amount in 1953 and 1954 by Mayflower which made silverware similar to the product range offered by Duchin Creations. The Mayflower lighter is rounded and has a swirl-rimmed pattern. The base of the lighter is made from sterling silver – 925 grade of silver. It is weighted and marked. 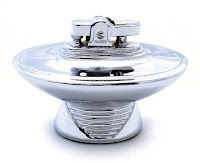 The lighter insert is a standard chrome plate insert made in Japan. 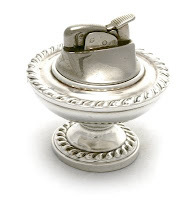 The same lighter insert was used among others in the Duchin Creations table lighter. The Canterbury and Evans Lighter Set was made in ca. 1950. It consists of a lighter and matching cigarette holder. Canterbury Silversmiths Inc. was a small company based in Brooklyn (New York, U.S.) active in the 1940's and 1950's. The "Canterbury" Trademark was registered on the 12th November, 1948. The company manufactured sterling and silver-plated flatware and hollowware, mainly butter dishes, trays, coasters, milk jugs, sugar basins etc. The set is kept in a simple neet design. It is made from a light thin but hard metal, probably aluminum and silver-plated. The lighter insert was provided by Evans (USA). It is made of brass and is silver electroplate. The lighter name is unknown though it was manufactured in relatively small amount in the 1940's by Duchin Creations starting from 1944. Duchin Creations had its headquarters in New York (NY, U.S.A.) and was a popular maker of a large line of sterling hollowware in the 1940's. 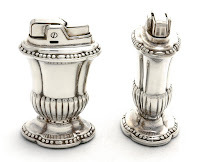 There are at least two different types of sterling lighters marketed by Duchin Creations. This one has a swirl-rimmed pattern and was matching many other hollowware items made by Duchin Creations like: candlesticks, pepper and salt shakers, candelabras etc. The base of the lighter is weighted. The lighter insert is a typical chrome plate insert made in Japan. This table lighter was made in cooperation with Evans by Hallmark Silversmith Inc in 1949 in the U.S. This company originated from New York (NY, U.S.) and was active since the 1910's till 1954 when they merged with Hunt Silver Co Inc to form Hunt-Hallmark Company. 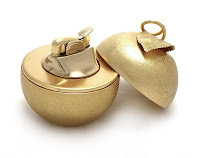 They made among others couple of fine silver tobacciana like cigarette urns, lighters and cigarette cases. 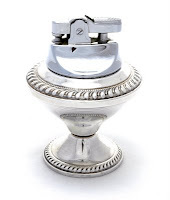 The base has a calicyform, likewise the Duchin Lighter, and is made of sterling silver – 925 grade of silver. On the edges there is a good looking tear pattern. The base is weighted. The Ronson Mayfair was first manufactured in 1936 in Newark, New Jersey, USA. It was a very successful product which was marketed till 1959 with a major change regarding the lighter fitment. Till 1956 the Ronson Mayfair had a Standard Ronson lighter fitment; although after 1955 the Essex fitment was introduced (see photo). This table lighter was advertised always as a pair and sold in a presentation box. The lighter is very handy and covered with a thick layer of silver. The bottom is padded with green felt. A newspaper advertisement from 1951 of the Ronson Mayfair says: "Dainty Silver Plated table lighters to harmonize with fine silverware. Like salt and pepper shakers, they're placed within easy reach of each setting, two or more for the well appointed dinner table". Stylebuilt Accessories Ltd. (New York) in cooperation with Evans presented in 1953 a very interesting lighter. Evans delivered the lighter insert and Stylebuilt prepared the base. Stylebuilt is a family operated company which exists on the market for more than 75 years. It is today known for producing fine traditional handcrafted gift-ware and luxury bath accessories. Everything they made has a unique style, including this table lighter. The lighter is heavy and relatively big. Three angels are holding the lighter rounded base which has a flourish design. It is made from a silver metal covered with a very thin layer of gold-color paint. The Ronson Nordic Set was first manufactured in 1955 in Newark (N.J., United States). The production went on till 1958. The set consists of a Nordic lighter and a matching cigarette holder. The set was made from a very popular in the 40's and 50's, especially in Europe, Black & Gold Marble (Portoro). The Ronson Nordic set was mainly manufactured for people who had an inkstand finished in this stone. 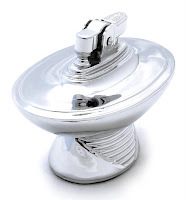 The base is in chrome plate with leaf and scroll pattern. The Ronson Nordic lighter was available in different finishes - two more types of marble, clear glass, light and dark wood. The Ronson Nordic in Black & Gold Marble finish was sold more often as a set with the matching cigarette holder (urn). The lighter has a smaller version of the Ronson Essex fitment. That is why the engineers added the lever action to make the lighter more easy to operate. The lighter insert is chrome-plated. The Ronson Forum Table Lighter was manufactured only in England between 1964 and 1969. 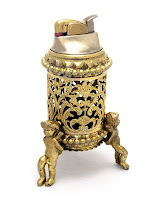 The base of the lighter is made of brass – partly satin and partly polished. The lighter insert – the Varaflame – is gold-color-plated and has a fingertip flame control – at least two different versions of the flame control are known. Napier cooperated with Evans in the late 1940's and 1950's. They made together very fine examples of modern craftsmanship. One of its creation is the Golden Apple manufactured in the 1951. 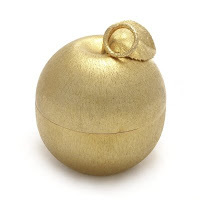 Evans provided the lighter fitment which is gold-plated and Napier Co. made its shelter in the shape of an apple. The brushed gold plate finish looks and feels good and durable. An interesting collectors' item made with taste. This lighter was also available in different shapes (ball, apple - look at Evans & Napier, American Eagle) and handles. The base is marked NAPIER, there is also a sticker GOLD PLATE.